Using a Monopod is a great way to get rid of blurry photos due to camera shake if you don’t want to carry a tripod. But monopods have their limitations: find out about choosing and using a monopod with these tips from Tony Page of Travel Signposts Photo. 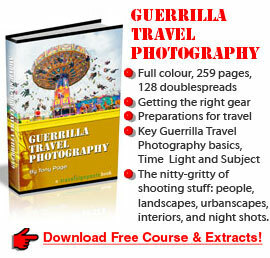 “Hi everyone, Tony Page from Travel Signposts Photo here again, and in our continuing War Against Blurry Photographs at this time we’ve enlisted the help of every travel photographer’s favourite third leg: yes, the monopod. Okay, monopods are not so good as tripods, let’s get that out of the way straight away. 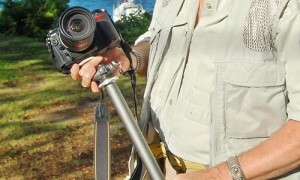 Monopods should be seen as stabilizers rather than as tripods. There’s an obvious reason for this, you can’t use a cable release with a monopod and they’re not free-standing. The principle of a monopod is relatively easy. You are part of a tripod: one of your legs forms one leg of the tripod, your other leg forms the second leg the monopod is the third. The cameras is mounted on the top of the monopod and placed firmly against your forehead so that you are basically forming a tripod. 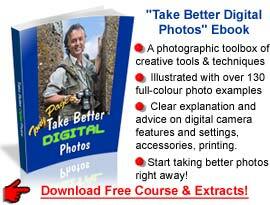 As you can see there are a few problems here, and not the least of which is when using a point-and-shoot camera and you want to focus on your LCD, you are really defeating the whole purpose of the thing. Because when you think about it, even if you’ve got your elbows jammed against your body and you’re holding the camera as firmly as you can, when you’re looking at the LCD it’s never going to be possible to hold it as rigidly as you can when you looking through, say, a viewfinder of a DSLR and you’ve got it firmly against your forehead. That said, there are many different types of monopods. First things first, check your tripod, because you can often unscrew one leg of your tripod and use that as a monopod. You will in that case of course need an extra ball and socket head on the top of your monopod so that you can mount the camera on there and get it at the right angle, otherwise it’s impossible to use. The next thing is to look at the bottom of the monopod’s leg. Some monopods these days have got a fluid head actually mounted on the bottom designed to make it easier for you to move and pan the camera around. But it’s really not necessary, especially for still cameras, and I believe it’s best to keep things simple. Now there are other advantages of monopods, of course, they are extremely useful as a walking stick if you twist your ankle or if you’re on a pilgrimage to Santiago de Compostela when they can be used as a walking pole. However, apart from that it is true if you want to be sneaky in museums, they can easily be disguised as a walking stick and, you know, it’s easier to get at least some photos inside there. However, I wouldn’t be advising that for one moment, you should completely stick to all the rules. Now that I am at this page all is clear. The image of the monopod shot on the main page is reversed. And I was thinking that Nikon had made a left-handed camera. Aha! Congratulations, Ron, you’re the first to comment on that! The truth is, the shot didn’t work with the long format and position of the caption, so I flipped it to get a better graphic effect (that carries on to the thumbnail,too). Of course, that wasn’t necessary anywhere else. Sorry to disappoint you, as I presume you’re a lefty! 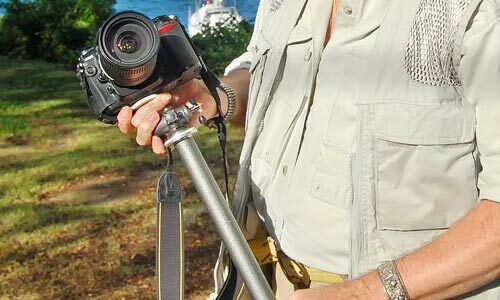 – Monopods are more acceptable to tourist site security staff than tripods.